The extended rim pans pictured below nest into sieves & may be used to run multiple test samples within the same stack assembly. Accurately produced in the U.S.A. Assured Accuracy of Opening - In the past, it has been very difficult and impractical for sieve manufacturers to be sure the wire cloth in the sieve was within the ASTM tolerances. Using sophisticated optical inspection equipment, a practical method has been developed to inspect each sieve prior to shipment to assure quality and meet ASTM tolerances. A specially built Image Analyzer is used for consistent accuracy, sieve after sieve. 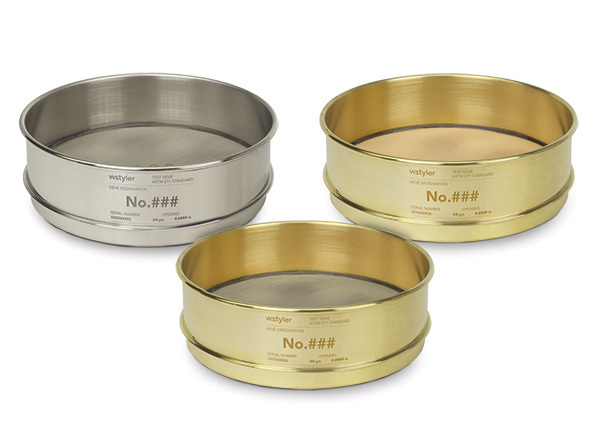 All Test Sieves are made in accordance with specifications established by ASTM E-11. Test Sieve Frames - Sieve frames are die formed for guaranteed fit and superior quality. 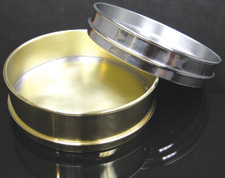 All test sieves are packaged in sturdy cartons for safe shipment. These cartons also provide the user with handy and protective storage containers. Standard Specification for Woven Wire Test Cloth and Test Sieves - Nominal dimensions and Permissible Variations for Sieve and Compliance, Inspection and Calibration Test Sieves. b) Only approximately equivalent to the metric values in column 1.
c) Not more than 5% of the openings may fall between the limits set by the values in Column 5 and Column 6. Provides the necessary protection and support for fragile fine mesh sieves. Especially helpful in extending sieve life in wet-sieving operations. Support cloth must be purchased with sieve. Add "s" to end of item number and price of cloth to price of sieve. Bulk Wire Cloth, we maintain an inventory of the entire ASTM E-11 wire cloth range in sheets and rolls. Also in stock are many market grade, tensile bolting and ISO (metric) wire cloth specifications. Call for current pricing and availability.